Dr. Thomas Henry Moray, like Nikola Tesla, believed that the earth is enveloped in an electrical energy zone that was free to be harnessed with the right equipment. Anyone who has witnessed the electrical phenomenon of the aurora borealis can attest to the energy streaming around us. The problem is how can that free energy be reliably and safely tapped. For thirty-four years, from 1909 to 1943, Dr. Moray, an electrical engineer and inventor, worked on the development of what he called "Radiant Energy." Dr. Moray invented the Moray Radiant Energy device. The whole apparatus was enclosed in a small box less than three feet square. One wire led from the box to a special balanced antenna and another wire was simply a ground connection. Apparently, the device siphoned energy directly from the air. Moray used a specially constructed high frequency transformer to control the voltage so that any desired level of power could be obtained. "It is a mere question of time before men will succeed in attaching their machinery to the very wheelwork of nature." 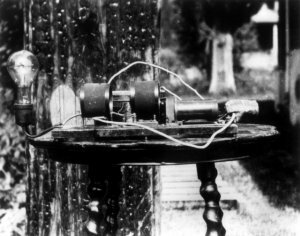 Dr. Moray's invention allegedly worked similar to how a radio receives radio waves. In fact, it was stated that it should be as easy to accept the fact that a solid-state device had been constructed for the purpose of receiving energy waves from the Universe as it is to accept a radio that receives radio frequencies. If one transposes electrical waves to sound while another transposes energy waves into heat, light or power, the fundamentals are the same in both radio receiving and the "radiant-energy" device (1). Moray's circuit of inductors, capacitors and oscillators were tuned to respond to the oscillating wave frequency emitted by the Universe. High frequency currents are especially difficult to insulate, but this problem was avoided by the ingenious operation of the oscillator tubes, which reduced the frequency on the output side. Dr. Moray demonstrated his invention many times in the presence of hundreds of reliable men and women, many of whom were highly trained physicists and electrical engineers. Research compiled by the technical staff of the Chicago Institute of Technology states that planet Earth receives energy from the sun continuously at the rate of nearly 160,000 horse power per inhabitant at the present time. In 1939, Dr. Gunn of the U.S. Navy Research Laboratories stated that the earth itself is a huge dynamo, producing 200,000 amperes of electrical current. There is little doubt that free energy is all around us. The conversion of matter to energy in the stars and the energy emitted during radioactive disintegration are well understood. Our planet is bombarded every minute by high frequency energy pulsing from our sun. Dr. Moray intended to tap this free energy and many believe that he succeeded. Tesla said, "Ere many generations pass, our machinery will be driven by power obtainable at any point in the Universe ? Is this energy Static or Kinetic? If Static, our hopes are in vain; if Kinetic, and this we know it is for certain, then it is a mere question of time when men will succeed in attaching their machinery to the very wheelwork of nature." Did Dr. Moray achieve Tesla's dream in the Utah desert? Scientists and scholars frequently visited Dr. Moray's laboratory in Salt Lake City, Utah. On October 29,1926, the Mormon inventor agreed to demonstrate his Radiant Energy device for a small group of potential investors. Dr. Moray packed his device into the trunk of the car. In order to make the test completely legitimate, the men drove 52 miles past the nearest power line and 26 miles from the nearest one-wire rural telephone line. In his letter of affidavit, eyewitness E.C. Johnson wrote, "Moray requested that we select a place near a stream of water so that the ground pipe could be sunk in its bed and be more effective, as the ground in the mountain was frozen. The antenna wire was put up without any aid or instructions whatever from Moray, as it had [already] been "balanced," except that Moray suggested that the wire be stretched tighter to prevent so much sag at the center. The antenna wire was insulated from the poles with two quartz glass insulators about six inches long. A piece of wire about two feet long connected each insulator with the pole. The lead-in wire was fastened to the antenna wire at a point about 10 or 15 feet from the east pole. I helped Moray solder the connection where the lead-in wire fastened on to the antenna wire and also helped him solder the ground wire to the rod. I stepped the distance between the two antenna poles and estimated it to be 87 feet as I took 29 steps intended to be three feet each." Another testimonial, dated February 21, 1927, apparently written by then Secretary of the State of Utah, Nilton H. Welling, is very persuasive. He wrote, "I first witnessed a demonstration of this device three months ago. The cabinet containing the machine has been simplified and improved. It was quite apparent there was no possible faking of the power produced. The tuning in device was improved and the time required to bring in the energy was shortened from five minutes to less than a minute. The operation was as simple as 'tuning in' a well-equipped radio set. This was shown by a lady who was witnessing the demonstration for the first time operating the device as easily as Dr. Moray himself, after she had seen him 'tune in' the energy. A pilot light on the cabinet first became illuminated. The switch was then moved connecting a light rack with the current. Instantly, thirty 50-watt lamps and five 100-watt lamps were brilliantly lighted. A regular Hot Point flat iron was then connected without [dimming] the lights in the least. The inventor asserted that the result would have been the same had one hundred lights been used in place of the 35 on the light rack. The lights and iron together were consuming more than four-horse power of electric energy. On account of the brilliancy of the light it was apparent that much more than the ordinary voltage was going into these lamps and when excessive heat developed in one spot, it made me feel that they would soon burn out, but they did not. I confidently believe that Dr. Moray is on the threshold of perfecting one of the most amazing fundamental inventions in history." Like many inventors, Dr. Moray's insistence on absolute secrecy regarding the inner workings of his Radiant Energy device was part of his undoing. His demonstrations had led to widespread interest by outsiders but it ultimately resulted in harassment and deception. In 1940, Dr. Moray was shot in his laboratory and was repeatedly threatened until he stopped his active research three years later. Attempts to interest the U.S. government in funding his project during the 1950's and 60's failed, mostly due to his insistence upon complete secrecy. Since Dr. Moray's death, the Cosray Research Institute located in Salt Lake City, Utah, has been attempting to collect his papers on Radiant Energy in order to reproduce the original device. The principle objective of the Cosray Research Institute is to eventually develop a practical radiant energy system and a theory to explain its operation. Dr. Moray's 1930 book, "Sea of Energy" is also available from the Cosray Research Institute. Not a believer in "perpetual motion, perpetual light or perpetual power," Dr. Moray did think, however, that the supply of radiant energy is ample for all mankind's power needs indefinitely. The history of the work done with radiant energy conversion seems to have been suppressed. T.H. Moray may have built a device capable of producing usable watts of energy, which if rebuilt, could be capable of answering the world's needs with a non-polluting form of energy. With good research and a little luck, maybe the question to the world's energy problems will be answered by tapping into radiant energy. If you are following this narrative in a linear fashion, next is a discussion of Walter Russell, "the Leonardo of America." Here are the footnotes (in parentheses and red above) for this page. They are hyperlinked when possible. (1) www.cyberportal.net/nuenergy.moray2.html Short article on the operation of the Moray Radiant Energy device and a photograph of Dr. Moray and his invention lighting a rack of electric lightbulbs. (2) www.cyberportal.net/nuenergy/manuscript.html [Note: This link is broken and will be updated in the near future.] The Moray Valve Manuscript. An account and brief explanation of the Moray Radiant Energy device which reportedly utilizes the vast store of energy throughout the universe through ionic oscillations. (3) www.geocities.com/CapeCanaveral/Launchpad/5971/moray.html [Note: This link is broken and will be updated in the near future.] Twenty-eight page document offering a supportive overview of the life and times of Dr. T. Henry Moray. Includes address for the Cosray Research Institute which is engaging outside consultants on a contract basis. If you feel you are qualified by virtue of a background in physics or engineering, you are encouraged to write for an application. Each consultant hired will be leased a complete set of Dr. Moray's notes and diagrams as well as any surviving equipment. (4) www.twelvestar.com/Sourceworks/Thomas%20Moray.html Article reprint from the September 1956 issue of Fate Magazine, published when Moray was still living. It entails some of the work that Dr. Thomas Henry Moray was doing as he attempted to tap into cosmic energy.